The first of the month, a pinch and a punch, the first person to say ‘White Rabbits’ gets a wish. Well we all forgot this in our house this morning. I was curious to find out about the origin of this superstition but interestingly there is very little cohesion or consistency about what is to be said or where it came from though it probably originated around the beginning of the 1900s whatever the variation it has the appearance of being nonsensical. And non-sense was the topic of the day as I sat with Stan Phillips of Readings For Life & Bernadette Phillips of New Insights For Change in the Coastguard Cultural Centre in Tramore, Co. Waterford (Ireland) musing over tea and the remains of lemon drizzle cake. We were all in agreement that now is all we have and that being in the unknown or the non-sense of life is where magic, serendipity and synchronicity reside. Just the effortlessness of our meeting had that quality. Stan & Bernadette are Facebook friends who I had never met, a Facebook message just before 2pm turned into tea by the sea at 3pm. And how wonderful is that. Later on my way home I am reminded again of the 1st of the month – this is May the start of Summer at least by the Celtic calendar and the busy burr of a family of fuzzy bumble bees nuzzling the nectar teats of this flowering hedge. Ireland is not known for it’s towering mountains but rather its gentle, rolling, ice sculpted slopes of soft boggy earth, furze, fraghan or hort berries and somnulent sheep. A slow drive across the border from Waterford into Co. Kilkenny and Tory Hill just 44 feet shy of mountain status. I chickened out on an outing here in December to celebrate the winter solstice sunrise; the warmth of my bed overuled the lure of pagan festivities. The proposal of a 10am start from my friend Marie, The Sea Gardener – an expert on foraging and nutrition of the sea shore, on a perfectly delightful late Spring day was a far more attractive invitation. We slide from our slow drive into the rhythm of a gentle climb under the full warm breathe of the sun with canine companions Topsy and Lucy. This unprepossessing hill revealed its magic at the Marian Cross summit. To the east the vista stretched across wind turbines to Mount Leinster and Mount Brandon, to the south Tramore’s Catholic Church spire a smudge on the horizon. A throne to the heavens on a beautiful day like this, the frauchan flowers just beginning to show, it is no surprise this place has a history that stretches back to the Greeks, is associated with druidic tradition and, I discovered on my post visit research has the remnants of the three chambered Faranogue Court Tomb. In the 1700 and 1800s it was a refuge for Irish outlaws and in fact the name Tory is derived from the Gaelic Toraidh meaning one who is persued by the law. More recently the hill was identified as an ideal site for a transmission mast but not everyone was in agreement. A night time mission by torchlight succeeded in dissembling the mast and now only the concrete foundation remains as a reminder not to mess with this hill. I spent my teenage years in Ireland by the sea. A place called Tramore an angelicized version of the Gaelic meaning ‘big beach’ and it is a wonderful beach. 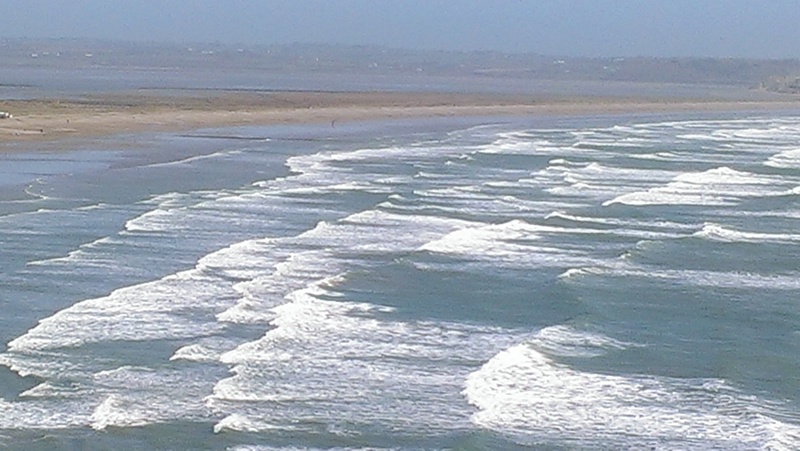 A three mile sandspit stretching out across Tramore Bay. For about a decade I have had the luxury of being able to fy from London to the local airport in Waterford just a gasp from the back of Tramore unique salt marshes but about 12 months ago flights were discontinued. By default I assumed I woud have to travel home via Dublin, a tedious journey involving a 4 hour coach trip at the Irish end. Perchance I discover there is life beyond London and there are regional flights from theBirmingham, Manchester & Newquay in the UK to Waterford. On Sunday I decided to try out the afternoon flight from Birmingham. Conveniently located just off junction 6 on the M42 a friend was able to drop me off en route from Stoke, where we had celebrated yesterday’s wedding Layers Of Love = Magic, to London. A dinky little hub of activity thronged with travellers and adorned with multi-cultural posters I was transported to the cusp of exotic travel in the blink of an eye. Queueing for security just heightened the tension. It all seemed to be happening at Birmingham. The other side of security had everything to serve the expectant traveller. Unfortunately I noted that my flight was delayed. However I had not accounted for the creativity of this little airport. Afte a little vascilation an alternative plane was found and the departure gate was opened with 15 minutes to spare. We had to bus it across the tarmac but en route it seemed we had mislaid a passenger or two so had to return to pick them up. We were 20 minutes late heading out on the runway but the pilot assured us that we would make up time. Despite the meandering of a scenic approach along the very beautiful Wexford coast and a long winded tracjectory directly across Tramore Bay, across the marram tufted expanse of dunes and the tranquil back strand we screeched into land a mere 9 minutes la at 15.29. A flight time of around 45 minutes. By 15.35 I was through passport control, past the entrance perimeter and walking down the airport approach to the country back road to meet my Dad who was primed to jump into his car at home on receipt of my landing text but not before turning down the friendly offer of a lift from a lady who didnt give a thought for where I might be heading. Oh I do love a small airport. I love the intuitive coaching work that I do, it is never a chore, rather always a pleasure to take a purposeful ride on my magic carpet. Part of my learning has been to hold the tension of giving away sessions and casting my pearls before swine. It is not that everyone hasnt got a heart and isnt at their core deeply imaginative and creative but unless they are open to a guide in that moment the seed may find itself in barren soil. When I realised this my ego went into overdrive to try and work out ‘how’ it would be possible to discern the worthy from the unworthy, the open from the closed, those who would take action from those who wouldnt. What a muddle. I know I am always ready to take that ride so the key is to see who is willing to cross that threshold to meet me. People’s willingness to pay is one way to judge that but it is not the only way. I choose to listen to a deeper beat and know that money is not the only gold that is there for me on this journey. This past week has revealed two beautiful testimonials from clients who didnt cross the threshold in the traditional way. Lauren, whose journey and testimonal I shared in my last blog, won a session in my monthly FindYourMojo competition and Ronan, a chance meeting while on holidays in Ireland in 2012 just asked straight up for a session. Ronan is Ronan Stone (dont you love the play on words!) a singer, song writer, writer, lover of words who has struggled with his place in the world. He didnt have any money to offer but his request was so direct and true that there was nothing to do but grab a coffee at T Bay Surf Cafe and unhitch that carpet. Within a couple of days of our session he wrote to thank me and say he had been racking his brains to find something to ‘pay’ me for it. Really all he had to offer was a song. I cannot tell you how wonderful it is to receive a song as a testimonial, I wont deny I dont get excited when I receive money, but Ronan’s song was a gift of gold straight from the soil of his heart. That would have been enough but yesterday he sent me a full recording which I attach here. I feel like the leprechaun at the end of the rainbow. So it is a big thank you to Ronan Stone for the smile he puts on my heart when he sings this song. The Way That I Choose. Although I have discontinued my monthly FindYourMojo competition Ronan’s experience has inspired me to offer a big reduction for one off FindYourMojo coaching sessions to kick start the year. Normally £150 I am offering sessions for £50 if booked before 31 January 2014. You will need access to an iPhone or iPad to download the FindYourMojo app from iTunes, following the instructions to find your two word MOJO and then email it to me below. Early in 2009 I was introduced to the concept of living my life intuitively and establishing goals created from my imagination. This blew my mind; intuitive choices are not SMART goals. They are often not specific, far from measurable, as to attainable, realistic & timely well I had brain freeze when my imagination advised me that I wanted to be a global warrior of discovery leading the way and connecting people through the warmth of technology. What the bleep!…..! Almost four years on I feel exactly like a global warrior of discovery. I now create choices as New Year resolutions and wait to see them manifest just by gentle consistent action to connect with each choice intuitively. As of February 2012 I have been on the road, following the breadcrumbs to live and work a life guided by my heart. In the past 5 months I have been sailing in the San Blas Islands in Panama, collecting shells on the freezing shoreline of Satellite beach in Florida, sipping coffee overlooking the chilly surf in Ireland and today I have just walked the Half Moon Bay coastal trail in California. I dont tell you this to impress but rather to illustrate the penny dropping of a choice created intuitively. I love the space where the earth meets the sea. This choice has effortlessly being manifesting in my life almost unbeknownst to me. Lovely lyrical wording that at a logical level sounds like I love the shoreline but putting it like that underestimates my journey and the experiences I have had. I notice that I am drawn to walk along the shifting line where the sea tickles the land; I love the treasures that are found there and tell tale trail of ocean detritus that mark the segue of the tides but there is so much more. I recollect that one of my favourite distractions in school was my geography homework. I was particularly drawn to maps and to drawing maps using a rainbow selection of coloured markers to artistically mark out where land masses and bodies of water came together. I would get lost in these creations to the detriment of less inspiring subjects such as physics or chemistry. My submissions were works of art. At the time I had no idea why I was so compelled to pour so much love into such a narrow activity. Now I make up that I had a deep knowing that there was something about that space that opens up inspiration and creates energy for me. When I am tired or overwhelmed being by the ocean calms me, sleeping on the ocean soothes me, sailing the seas expands my mind, distracts me from the rational and steeps me in my imagination. I am always refreshed, energised and thinking expansively after a spell by the sea. I am rushed by the wild chaotic femininity of the sea and the steadfast masculine anchoredness of the land, I love the fusion of these two forces at the shoreline each bringing their own gifts together to create a space that is a child born of the two. Whether looking at a map, hunkering over a magical tide pool, drinking in the San Mateo hills, watching kite surfers dancing around the jagged tooth Maverick rocks, being tricked by warm sun & cold breezes, ear wigging on conferences of gulls or buzzed by macho pelicanos there is magic in this place. I am not alone in my fascination with this space – there is a nebulous yearning that rivets many of us to Coast, the magnificent BBC TV creation now on its eighth series, which exquisitely charts life in the space where land and sea come together. Today I was filled to overflowing with a knowing that goes beyond understanding that where the earth meets the sea opens up doors for me that are foundational to living the fullness of the life I love. I am ready to sign off on the creation of this choice and embed it as a fundamental underlying structure in my life. No longer is visiting the sea a nice to have in my life it is a basic necessity and I am looking forward now to diving deeper into that space by creating a new choice to lead me to more discovery.